disability rights center | The Disability Rights Center (DRC) is the oldest non-membership, cross disability organization in the nation. 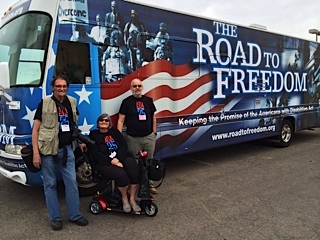 The Road to Freedom ADA Bus Tour with Tom Olin is boycotting the September 17 scheduled stop in Lansing, Michigan for the 25th ADA celebration hosted by Disability Network Michigan. Two days ago we learned Peckham Industries was a primary funder of the Lansing ADA celebration so we hit the brakes and pulled a U-turn. Peckham is a key Source America contactor who makes billions off of employing people with intellectual disabilities and paying less than minimum wage. (Their “employees” could be placed in competitive employment and paid at least minimum wage). The federal Department of the Treasury is investigating them for fraud. The Road to Freedom Bus Tour needs funding to get to Lansing for the demonstration against Peckham and Source America. 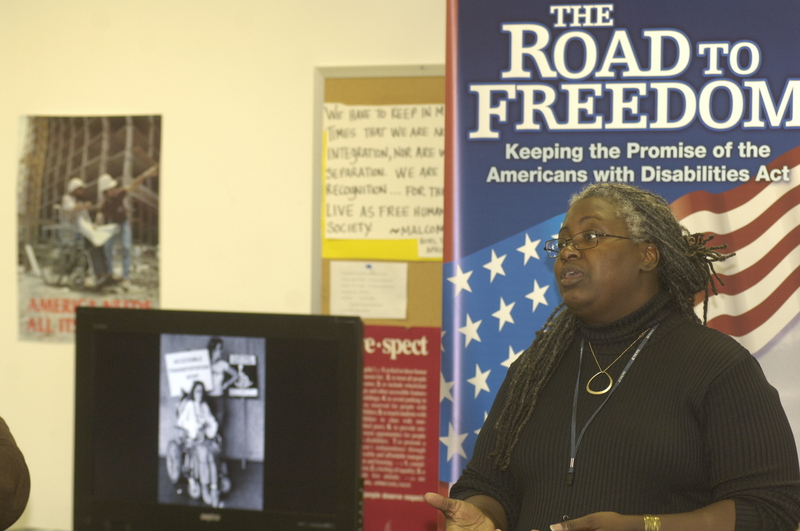 A key objective of the Road to Freedom Bus Tour is to support local disability rights groups speaking for consumer choice and work that strengthens the disability movement. We need $1500 to bring the ADA Bus to Lansing on September 17, 2015 for the counter demonstration. Donations can be made to the following 501 (C) (3) fiscal agent for the Road to Freedom Bus Tour. 100% of donations go to keeping the ADA bus on the road. This post speaks well to a dangerous attitude that the disability rights movement has been fighting for decades: better dead than disabled. Not Dead Yet has taken the lead but many of us have worked to change public attitudes. Still, the stigma persists. So this is well worth the read. Once in awhile something wonderful makes me fall in love with the disability movement all over again. I am now heart expanded and all a flutter mushily loving our people, our leaders, our head over heels commitment to full societal inclusion… take out all the stops! Last week Texas ADAPT issued a statement saying that the LBJ Presidential Library was hosting a summit about the 1964 civil rights act. Topics being covered included not just the classes addressed by the 1964 legislation but nearly everything tangentially related except the kitchen sink and..people with disabilities. But what made me fall in love with us all over again was the way our community came together in the days following the call from Texas ADAPT. The National Council on Disability (NCD) whipped out a statement calling on the LBJers to include disability and then the National Disability Leadership Alliance (NDLA) flew forth with one too. The ADA Legacy Project is putting out a release. And these statements are blanketing social media and disability nation. Below you will find the ADAPT media advisory for the April 7 press conference in Austin (and check out the list of LBJers included topics) and links to statements from NCD and NDLA. Oh Doctor, we are fabulous. My-oh-my-blueberry pie we are a mighty bunch. Ya gotta love being us. Come and celebrate the 50th Anniversary of the enactment of the Civil Rights Act and the Civil Rights Summit being held at the LBJ Presidential Library. The Civil Rights Summit will be championed by Presidents Jimmy Carter, William “Bill” Clinton, George W. Bush and Barak Obama. • Women: How High is the Glass Ceiling? 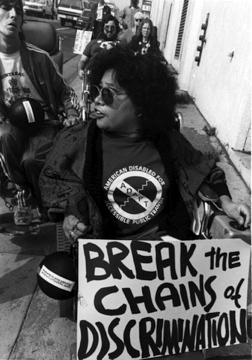 People with Disabilities & the Americans with Disabilities Act of 1990. 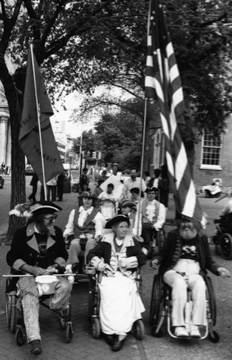 Perhaps the greatest liberation legislation for 52 million Americans in this Nation, the ADA will recognize its 25th Anniversary next year. Come celebrate inclusion in the American arena by and for persons with disabilities. Portlight Strategies is a wonderful organization that serves people with disabilities and their families when disaster strikes. Paul Timmons started the program after hurricane Katrina. He was disgusted that some groups were trying to raise beaucoup bucks to set up an 800 number for post disaster calls while Paul and his wife Kelly were on the scene delivering wheelchairs and other supplies. Portlight has responded to disaster in concrete ways on the scene when and where disaster strikes. Support Portlight and make your own disaster plan. My consciousness was raised by Katrina as well. A dear friend repeatedly tried to secure transit for a person with quadriplegia in New Orleans. That person had called ahead but no one came. My friend stayed on the phone with her as the waters rose and she drowned. This tragic death could have so easily been averted. That woman’s story is etched in my heart.My friend went on to head up accessible emergency preparedness for the federal government. There is a challenge which she will be working at for some time. Visit www.portlight.org for more information. Disabled World posted a great blog which we are reprinting below. 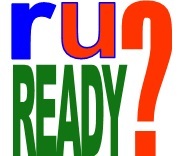 http://t.co/XuiH3wkAc9 #RUReady? For the millions of people with disabilities around the world, surviving a disaster can be just the beginning of a greater struggle. For people with disabilities, barrier free, as well as, barrier-ridden environments become a great deal more hostile and difficult to deal with during and after an emergency. For example, people with physical disabilities may have reduced ability to get to accessible exits, as well as reduced access to their personal items and emergency supplies. People with vision and hearing loss and people with speech related disabilities often encounter many more communication barriers, especially when regular communication channels are down or overloaded. These barriers appear at a time when rapid communication may be crucial to survival and safety. Emergency, or disaster, planning includes preparing organizations and staff to deal with natural and manmade disasters; to support people with disabilities in preparing for a disaster; and to provide education and information to ensure local and statewide emergency officials are fully prepared to address the needs of people with disabilities in the event of an emergency. Often the needs of people with disabilities in emergency preparedness are unaddressed or plans are not well coordinated, leaving individuals with disabilities unnecessarily vulnerable in the event of an emergency. The critical needs of individuals with disabilities during an emergency include the evacuation of transit systems, getting to safe shelter in the event of a natural disaster, and full access to transportation systems when there is a need to evacuate a particular location. Ageism In Disability Rights and Justice? Over the past months I have heard strange and ageist references from folks whose work I respect. Examples? There are many and I suppose I should offer one or two. Recently I was interviewing a middle aged organizer for an article about an issue on which there seemed to be controversy and two clear sides. The organizer came down firmly on one and noted that “the only ones who were against that position were older.” Was that true? And if so, what did that mean? Ought I discount a position because young people did not hold it? Perhaps the advocate meant the reverse..that I should discount the side held by younger leaders because they had less wisdom and experience. Another example came from a DC supervisor in the disability world. When discussing hiring for one of the primo disability good government jobs, he noted that he wasn’t going to hire someone “looking for a position to retire into.” This was voiced in a public social setting. That made me think that it must be a generally accepted attitude. Yoo hoo, there is a law against that…the Age Discrimination in Employment Act (ADEA). Most of the ageing folks in the movement (let me disclose that I am one of ‘em: a proud crone still fighting for full societal inclusion) are open to and encouraging of younger leaders. There must be some who fear our jobs or roles being usurped by younger activists or who don’t want to entertain fresh ideas but I’m glad they are not rocking’ or rollin’ in my world. But what is it with these calcified, ageist views held by some of our younger leaders? Truly we don’t have that much time to debate the topic. Police are regularly beating up and murdering people with disabilities. Our people still rot away in institutions because of a huge lack of affordable, accessible, integrated housing. Many of us toil away in sheltered workshops for way less than minimum wage. The list of life threatening, spirit breaking injustices is long. Every activist and advocate is needed in our serious and ongoing struggle. This is not a game we are playing. Everyone interested and willing to work is needed: all disabilities, ages, races and gender identities. We need to be as inclusive and non discriminatory of each other as we expect society to be of us. Age discrimination? Really folks? Get over it now. Our people are dying.